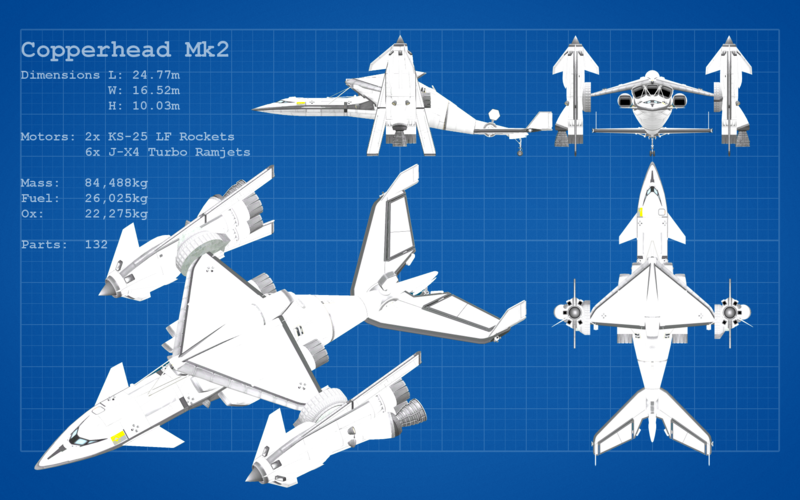 A mod aircraft called Copperhead Mk2. Built with 132 of the finest parts, its root part is mk2Cockpit.Standard. 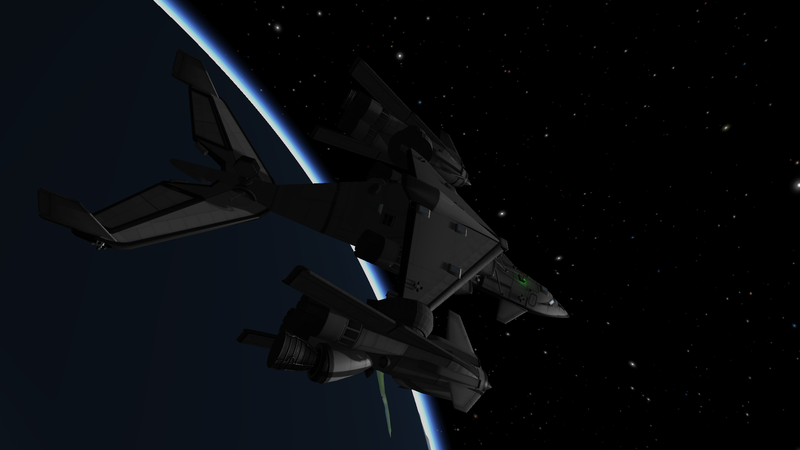 Roughly inspired by the Copperhead dropships from the Final Fantasy universe. I usually bind [i] and [k] to manual rotation control, not sure if it is saved with the craft file. Not needed for takeoff, but useful for landing under power as opposed to using chutes. * Select control point, usually cockpit, but there is a drone core just behind the cockpit for unmanned operation. * Nose will automagically rise and fall. Use Action Group 3 to swivel the engines for foward flight when nose is at or near its highest point. This will stop the nose from coming back down. * As ship accelerates and climbs, watch for airspeed to maximize at around 900-1100m/s. * Reduce throttle to zero when AP is at or above 75km. Lock SAS to prograde vector to reduce drag while coasting out of the atmosphere. * Set a maneuver node at AP to circularize orbit. Increase throttle to about 25% for circularization burn. The rotatrons wobble a bit due to how KSP works and this will induce oscillations which may get out of hand with higher power output. If wobble gets bad, reduce throttle and allow ship to recover. You should have about 200m/s delta v remaining.